The all-new 2014 B-Class Electric Drive features dynamic design, a premium interior and a powerful electric motor for emission-free mobility. This allows for lively, effortless driving pleasure over a real-world range of 85 miles (EPA)*. In addition, the B-Class Electric Drive is digitally networked. Thanks to its connectivity, it can be conveniently checked and configured via the internet. As the Mercedes-Benz among electric vehicles, the B-Class Electric Drive sets clear standards in terms of comfort, quality and safety for up to five occupants. 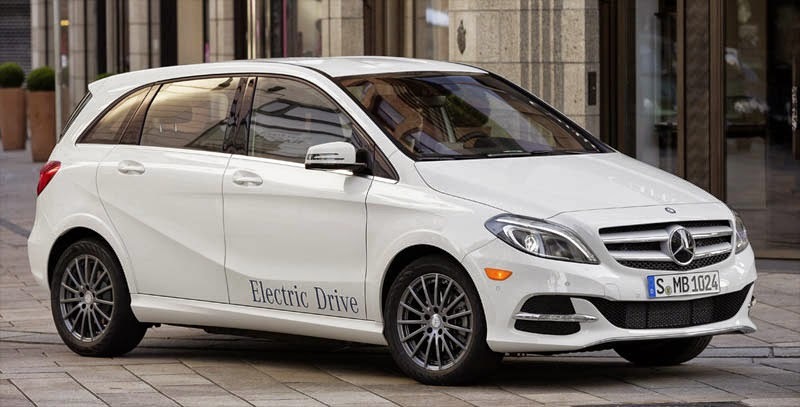 The B-Class Electric Drive, bearing the unmistakable three-pointed star trademark, will first be launched in the US market in the summer of 2014. The new B-Class Electric Drive surprises with an especially dynamic driving experience. It provides noticeably powerful acceleration, while gliding along quietly. The new electric Mercedes offers the driver and up to four passengers the familiar high standards of ride comfort in a high-class, spacious and precision-designed interior. The B-Class Electric Drive combines dynamic and driving pleasure with zero local emissions – in short: it delivers electric driving at premium level. 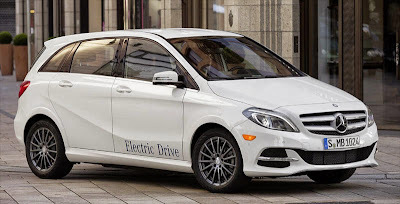 The new Mercedes-Benz B-Class Electric Drive is based on the conventionally powered B-Class, for which the current generation has become a bestseller since being launched in many countries in 2011. Since the launch of the first B-Class version in 2005, Mercedes-Benz has seen customers taking delivery of over one million of these vehicles. As an especially versatile vehicle concept, the B-Class with its innovative electric drive now allows additional environmental friendly capabilities to Mercedes standards. Quiet and local emission-free driving is ensured by an electric motor generating 177 hp (132 kW). Typical for an electric drive system, the motor develops its maximum torque of 251 lb-ft (340 Newton meters) from the very first touch of the accelerator. This is approximately equivalent to the torque from a modern three-liter gasoline engine. The result is noticeably powerful acceleration from a standing start. The electrically driven B-Class drives from zero to 60 mph in 7.9 seconds. Effortless drivability and exhilarating driving pleasure with a high level of comfort are thus guaranteed in every situation. The power supply to the electric drive is delivered via a highperformance lithium-ion battery, which is compactly and safely housed in the “Energy Space” in the underfloor of the vehicle. Such intelligent packaging allows the five-seater to retain the B-Class’s familiar spaciousness in both its interior and its luggage compartment of 17.69-51.42 ft3. In the interests of optimizing range, the top speed is electronically limited to 100 mph. Depending on driving cycle; the vehicle has a range of 85 miles (EPA)*. This permits emission-free driving not just in city traffic and on short journeys, but also over longer distances – such as a daily commute. The B-Class Electric Drive can be charged from any standard domestic power socket. For a range of 60 miles, the charging time at 240V in the United States is less than 2 hours*. On the road, the electric drive itself makes its own contribution to a favorable energy balance by converting kinetic energy into electric current during coasting and braking, and feeds this energy into the battery. Refined sportiness combined with aesthetic appeal – the B-Class Electric Drive features the self-assured and dynamic styling so typical of Mercedes with powerfully defined lines and finely crafted details. The front and rear sections express the width of the vehicle. This is ensured by the wide, prominent grille and the headlamps, which wrap round into the sides, as well as by the wide rear window, two-piece tail lights and large tailgate with deep sill. A dynamic look is created by door-sill panels and striking bumpers with bar-shaped LED daytime running lamps. The charge socket is inconspicuously installed behind the conventional fuel door. The three large round center air vents with their uniquely styled cruciform nozzles add a sporty flair that contributes to the overall emotive design idiom of the interior. Positioned above the air vents and seemingly free-floating is the screen for the telematics system – a state-of-the-art eye-catcher in the cockpit. In terms of information and communication systems, the electric B-Class offers levels of comfort and functionality that is customary of any Mercedes-Benz. The standard equipment package includes a head unit with 5.8 in (14.7 cm) color display, twin tuner and MP3- Page 4 compatible CD player as well as USB port. The Becker® MAP PILOT is the standard navigation system while the COMAND multimedia system with internet access, navigation and LINGUATRONIC voice control is also optionally available. Thanks to its state-of-the-art technology, the B-Class Electric Drive is not just sustainable and agile, but also connected. For example, the Vehicle Homepage allows convenient remote interaction and remote configuration of the vehicle. The driver can use their PC or smartphone to conveniently access the vehicle via the internet. 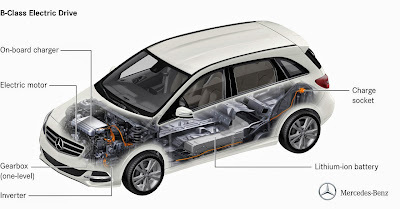 It is possible, for instance, to determine the current state of charge of the lithium-ion battery or show the vehicle’s current range on a map. In addition, the planned route can be displayed, showing at a glance where the vehicle can be recharged along the way, should this prove necessary. The range of connected services is rounded off by a feature that allows individually timed pre-heating or cooling of the vehicle. This pre-entry climate control system makes the B-Class Electric Drive unique in its segment. Mercedes-Benz applies its familiar, high safety standards to the BClass Electric Drive. Thanks to the innovative “Energy Space”, the battery is safely accommodated in the underfloor of the vehicle, where it is ensured protection in the event of a crash. In addition, Mercedes-Benz has equipped this innovative electric car with the radar-based collision warning system COLLISION PREVENTION ASSIST with adaptive Brake Assist as standard. This assistance system gives the driver a visual and audible warning of detected obstacles, prepares them for braking action and assists them with the braking process as the situation requires. In this way, it significantly reduces the danger of a rear-end collision. Additional cutting-edge driver assistance systems are also available, including Blind Spot Assist, Lane Keeping Assist and Active Parking Assist. Locally emission-free electric vehicles such as the new B-Class Electric Drive are a key part of Mercedes-Benz’s strategy for sustainable mobility. The Stuttgart-based premium manufacturer is asserting its claim to leadership in this sector with electric vehicles that are fully suitable for everyday use. Mercedes-Benz aims to strengthen its position in future, not least with the new BClass Electric Drive, which will be available initially in the USA as of mid of 2014, before subsequently being launched in European markets.